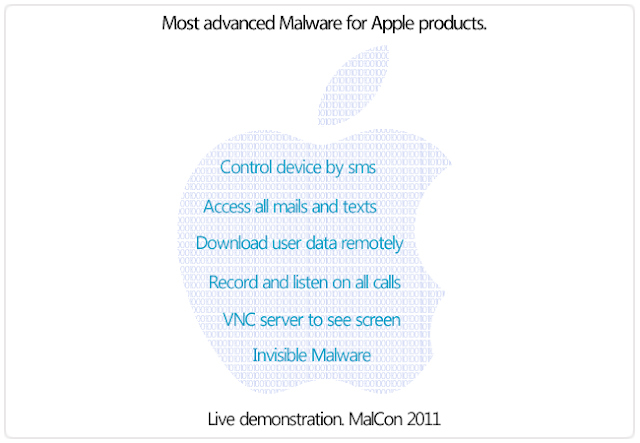 Most advanced and dangerous malware for Apple products - why you should be concerned ! Indian security researcher from MalCon has created an advanced and dangerous malware for Apple products which can not only compromize your privacy but also steal important data and let hackers control your device by simple text messages. If you are using any Apple product such as iPhone, iPad or iPod, then you shuuld be concerned. Indian security researcher from MalCon, Atul Alex has created an advanced malware for the Apple products which can not only intercept calls of users, steal data, but also provide a reverse VNC to see remotely all the actions of the victim. The malware can be deployed remotely over the web and is supposed to work on the latest iOS 5. Atul Alex, Technical director of MalCon said "Apple products are extremely secure by design. The malware works on jailbroken devices - something which over 90% of users have. If your device is not jailbroken, you have nothing to worry about!". However, over 90% of users normally jailbreak their devices. iOS jailbreaking, or simply jailbreaking, is the process of removing the limitations imposed by Apple on devices running the iOS operating system through use of custom kernels. Such devices include the iPhone, iPod Touch, iPad, and 2nd Gen Apple TV. Jailbreaking allows users to gain root access to the operating system, allowing iOS users to download additional applications, extensions, and themes that are unavailable through the official Apple App Store. A jailbroken iPhone, iPod Touch, or iPad running iOS can still use the App Store, iTunes, and other normal functions, such as making telephone calls. The Malware will be demonstrated next month at the upcoming International Malware Conference, MalCon in Mumbai, India. The researcher Atul Alex has previously coded and demonstated a custom malicious firmware for Symbian last year.